Fuel Saver Technology offers improved fuel mileage in SRT® vehicles, without compromising the power churned out from the 6.4-liter HEMI® V-8 engine. Fuel Saver Technology is a torque-based system, which deactivates four cylinders when full power is not required. The limited-slip differential on the Challenger SRT® reduces the amount of clutch slip between each side of an axle. The system is torque-sensing whereby the speed of the inner wheel versus the outer wheel speed is found, then modulated to make the pair equal. Launch control serves two main purposes in SRT® vehicles: to mitigate wheel slip in a launch situation and to improve straight-line acceleration. Learn about the ins and outs of the system from SRT engineer Marty Jagoda. When it comes to all-out performance, a manual transmission is the way to go. The Tremec® six-speed manual is the transmission of choice on the Challenger SRT® and allows the car to sprint from 0-60 mph in less than five seconds. 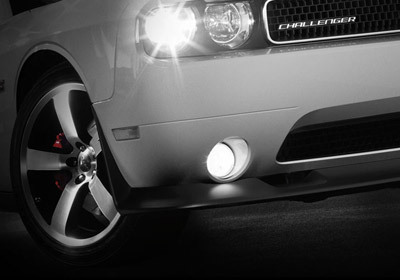 Aero balance is a must for the Challenger SRT®. A front chin splitter and rear spoiler provide stability that is vital for outstanding ride, handling and capability. 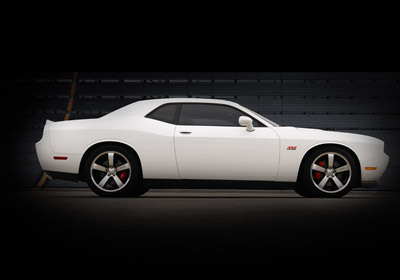 To owners of the Challenger SRT®, the numbers 3, 9 and 2 have a very deep meaning. 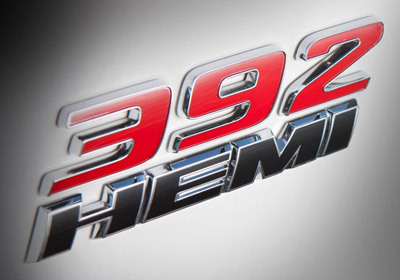 Found on both the fenders and the valve covers, the 392 badging on the Challenger SRT refers to the cubic-inch displacement of the HEMI® engine under the hood. Creating a control in terms of downforce between the front splitter and rear spoiler was critical in the development of the Challenger SRT®. Time spent in the wind tunnel helped perfect this balance and add to the overall ride and handling of the car. SRT® Performance Pages provide real-time data in a vivid 8.4-inch touchscreen. Performance Pages track: 0-60 mph time, one-eighth mile and quarter-mile runs, lateral and longitudinal G-forces, steering angle, horsepower and torque output, and 60-0 mph braking distance. Bridging a gap between classic muscle cars and their current-day brethren is the iconic Radar Red interior. Radar Red is a vibrant hue that instantly catches the eye when opening the door of the Challenger SRT®. The 5-Year/100,000-Mile Powertrain Limited Warranty. Enjoy an exhilarating drive in your SRT® vehicle with the knowledge you are covered by a 5-Year/100,000-Mile Powertrain Limited Warranty. It covers the cost of all parts and labor needed to repair a covered powertrain component. The limited warranty also provides towing to the nearest Chrysler, Jeep®, Dodge, Ram or SRT Performance Dealer, if necessary. The limited warranty is transferable to a new owner during the warranty period. SRT® brake testing is conducted at one of the most challenging braking courses in existence. The target: eliminate brake fade under heavy braking conditions. Available Bilstein® Adaptive Damping Suspension (ADS) systems get the most out of each SRT® premium model. You expect different ride and handling dynamics from a Challenger SRT than you would from a 300 SRT. And SRT delivers with the ADS system on premium models that allows driver-selectable suspension tuning.